Evelyn Underhill was one of the leaders of the movement rekindling interest in mysticism in the English-speaking world, and especially among Anglicans. Her 1911 book, Mysticism, is a spiritual classic. Much more than an academic study of the topic, it invites the reader into the experience of it. O king of night and day? than if a host did round me stand. and death doth know his hour. no power can wrest my soul. A man that heeds the heavenly call! Thy bidding when we go. Thou art our trust, O king of kings. Here’s the commemoration in Holy Women, Holy Men. Today is the commemoration of Monnica, the mother of St. Augustine of Hippo. I can’t let the day pass without some comment. I used her commemoration at today’s Eucharist. It was difficult for me to say the collect without snickering, having internalized the Confessions through teaching it yearly for some 15 years, “love and prayers and tears” hardly describes Augustine’s depiction of her. She was a woman of deep faith: among those who sang with Ambrose in the Milan basilica while surrounded by imperial troops demanding it be given over to the Arians; her deep piety to the martyrs that Augustine (and Ambrose were uncomfortable with) and as mentioned in an earlier comment, her status in the Cassaciacum Dialogues as the model of theological wisdom gained through faith that could instruct young intellectuals. 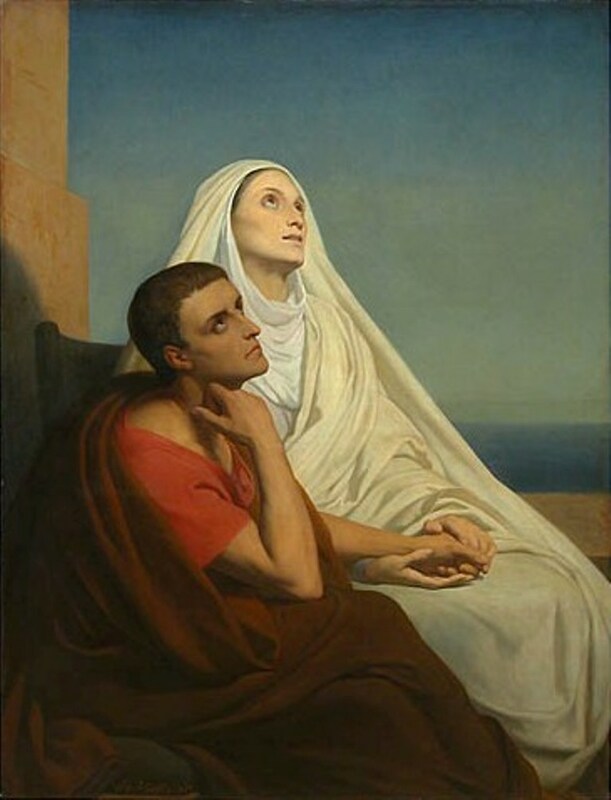 She did pray for Augustine’s conversion, but she also acted to make it more likely, by pleading with him and by encouraging him to listen to Ambrose’s sermons, and to talk with the great Bishop. The beautiful scene that Augustine describes in Ostia when together, in conversation, they ascended from earthly love and conversation, to the beatific vision, is one of the great moments in Christian spiritual writing, and presumably in Christian spiritual experience. It continues to give me chills every time I read it (30? 40? times) as it did during today’s Eucharist, in spite of the suppressed snicker during the collect. Today marks the 66th anniversary of the martyrdom of Dietrich Bonhoeffer. There’s a brief bio on the Holy Women, Holy Men blog. Bonhoeffer was both a powerful witness and martyr to the faith, and a challenging theologian. A recent book by Martin Marty explores the history of his Letters and Papers from Prison, which his close friend, confidant, and biographer Eberhard Bethge edited and published. Here’s an excerpt. Here’s more on the series “The Lives of Great Religious Books” to which Marty’s book belongs. Like a squire from his country-house. As though it were mine to command. Like one accustomed to win. Am I then really all that which other men tell of? Or am I only what I myself know of myself? Faint, and ready to say farewell to it all? Who am I? This or the other? Am I one person today and tomorrow another? And before myself a contemptibly woebegone weakling? Fleeing in disorder from victory already achieved? Who am I? They mock me, these lonely questions of mine. Whoever I am, Thou knowest, 0 God, I am Thine! Antony is one of those saints who has been a fixture in the liturgical calendar for centuries. And rightly so. Antony is one of the most important figures in the birth of monasticism. Antony lived in the third and fourth centuries. We’re not exactly sure of his dates, but the best guess is that he lived from 250 to 350 or thereabouts. He lived in Egypt, was the child of wealthy Christian parents, and after their death, while he was still a young man, he heard the gospel for today read and decided that was what he wanted to do. He put his sister in a convent, gave away his money, and went off into the desert to seek intimacy with God. Over the years, he moved further and further away from civilization, but wherever he went, he was pursued by curiosity seekers and by would-be disciples. Occasionally he would return to the city. We know that when he was a very old man, he went to Alexandria, which was the Egyptian metropolis, and the leading center of Christianity in the region, at least twice, and conferred there with bishops. The flight from the city into the wilderness was not unique to Christianity in Antony’s day. Wealthy people had begun to abandon the city for the countryside, where they could live in leisurely quiet. Poor people fled the city to seek food, shelter, and protection. What set monasticism apart was the certainty that the city was an evil place, that the wilderness was more suited to the pursuit of God. This tension between city and wilderness is deeply ingrained in our own culture and in the cultures that gave rise to the biblical writings. It’s been a very long time since we in America saw urban life as the ideal.. We may not prefer the wilderness to the city, but we certainly tend to distrust the city, and all that it represents. Longer ago, the distrust of the city and even the town ran much deeper. When I was a boy, my mother read the books of Laura Ingalls Wilder to my sisters and me. If you remember them, you remember that Pa was always on the move further west, further into the wilderness; as soon as he could see the smoke from a neighbor’s chimney, he was ready to find somewhere new to live. Antony did much the same, and indeed throughout the Middle Ages, monks settled in the wilderness, in places as remote as possible. There’s something of an irony here, however, for wherever monks went, laypeople quickly followed them. Antony’s biographer, Athanasius, said of Antony that “he made the desert a city.” By that he meant two things; first: Antony and the monastic ideal were so popular that perhaps thousands followed him into the desert; second, that in their communities, the monks created a new kind of city, focused on the worship of God. The wilderness also plays a role in the story of Jesus. Jesus was baptized by John, who lived in the wilderness, dressed in camel’s hair, and ate locusts and wild honey. People came out into the wilderness to see him. He seems to have been something of a curiosity, but the encounter with John changed people’s lives. In the weeks to come, we will hear of Jesus’ own journey into the wilderness, where he will be tempted by Satan.That encounter with Satan in the wilderness seems to be a turning point. It comes immediately after his baptism, and after the baptism, Jesus returns to Galilee and begins his public ministry. Usually when we think of the image of wilderness, we think of wasteland, of danger and violence. In the language of spirituality or religious life, the wilderness is often used as a metaphor for a period of intense struggle, or perhaps a feeling of alienation from God. For Antony and the other Egyptian monks, the wilderness or desert was not a place of alienation from God. Rather, it was a place that enabled intimacy with God. Stripped bare of everything but the essentials, the monk could focus only on what really mattered—his or her relationship with God. Compared to Antony, of course, our lives are much more complex. The idea of throwing it all away for the opportunity to focus on one’s relationship with God may seem appealing occasionally, but few of us would ever act on that impulse. We all have those times in our lives when it seems as if we are in a desert, when the old way of doing things, our lives and lifestyles, seem difficult or meaningless. Sometimes, in those deserts, we seem to be all alone, abandoned even by God. That feeling of abandonment was not foreign even to those monks and nuns of the early centuries of Christianity. They left behind stories of their struggles with temptations and their struggles to deepen their relationships with God. Antony’s example reminds us that even there, in the wilderness, God is present. Antony’s life and lifestyle may seem completely alien, perhaps even bizarre to us. Few of us would ever contemplate, at least for more than a moment, throwing everything away in our pursuit of God. That’s exactly what he did, and we might wonder about the impact of that decision on those around him—on his sister who he put in a convent. But his example is also a lesson that we respond to the call of God in very different ways. Today’s gospel led Antony into the wilderness. The very same words of Jesus, nearly 1000 years later, spurred St. Francis to begin a very different form of the religious life, focused on poverty, on preaching, and reaching out to those in need. The question for us is how do we respond, authentically and passionately, to the call of Jesus today? My understanding and speaking, my leisure, my activity my doing and thinking, my good and ill fortune, life and death, health and sickness–let absolutely all that I am, experience, feel and understand be employed and expended for them, for whom you yourself did not scorn to expend your very life. And so I pray you teach your servant, Lord, teach me by your Holy Spirit how I may spend my substance for them. Grant, Lord, by your grace, that I may bear patiently with their frailty, sympathize kindly and support with tact. Let your Spirit teach me to console the sad, strengthen the faint-hearted, raise the fallen; to be weak with the weak, indignant with the scandalized and to become all things to all men, that I may win them all. pour your Holy Spirit into their hearts that he may keep them in unity of spirit and the bond of peace, chaste in body and humble of mind. May he himself be with them when they pray and inspire the prayers it pleases you to grant. May the same Spirit abide in those who meditate, so that, enlightened by him, they come to know you and fix in their memory the God whom they invoke in their distress and look to in time of doubt. May that kind comforter be swift to succour those who struggle with temptation and sustain them in the trials and tribulations of this life. These quotations are from The Cistercian World: Monastic Writings of the Twelfth Century (Penguin Classics), translated and edited by Pauline Matarasso. I was surprised by the appearance in Holy Women, Holy Men of a commemoration of Karl Barth. Not that he isn’t important, mind you. No, what took me aback was his presence in a volume produced by politically-correct Episcopalians in the twenty-first century. I would be curious to know about his presence in the syllabi of theology courses offered at Episcopal seminaries. Barth was an important stage on my own theological journey. I read the Commentary on Romans as an undergraduate, then worked through the German original of the second edition. His insistence on the utter transcendence of God and the centrality of Christ were revelations to me and helped me move away from the theology of my upbringing. His resolute opposition to Hitler and his sharp criticism of his teachers and 19th century liberal theology were helpful as well. Thinking about Barth today reminded me of how far I have come theologically in the last thirty years. I don’t know that I’ve read anything of his since the very early 80s. Certainly at Harvard in that era Barth was mostly a foil for critique, almost a straw man. We were certain we had moved beyond him. The write-up on Barth for Holy Women, Holy Men provides a standard biography and some sense of Barth’s place in twentieth-century theology. It makes no mention of his impact on Anglican theology and I suspect for most Anglicans with advanced training, their indebtedness to Barth is relatively slight. He was a Calvinist after all, and although he had a deep Incarnational theology, he was also convinced that there was a chasm between God and God’s creation. This meant that he was suspicious of reason. To put it in more positive terms; for Barth, the Word of God was the only certain knowledge. http://ratherfondoftheepiscopalchurch.blogspot.com/ People who are rather fond of the Episcopal Church, a collections of reasons to be so.